TORONTO, ON., (June 7, 2013) – People interested in the latest innovations in green transportation will be heading to downtown Toronto on Sunday for the fourth annual ECO-WHEELS show. The event, which promotes awareness for eco-friendly cars, motorcyles, scooters and bicycles, will feature a special “ride and drive” area where visitors can test drive both the Toyota Prius c and Toyota Prius Plug-in Hybrid Vehicle. The two newest members of the Prius family will be featured prominently at the show. The Prius c is nimble, safe, offers exceptional fuel economy, and is perfect for the budget-conscious urban driver as the lowest-priced hybrid on the market. It also comes with special advanced technology tools like ECO Score and ECO Savings that allow drivers to track their fuel savings. The Prius Plug-in Hybrid Vehicle (PHV) offers extended all-electric range. 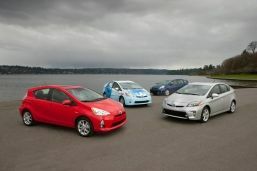 It’s the first plug-in vehicle for the Toyota brand and offers the lowest starting MSRP of any plug-in hybrid in Canada. The PHV features a powerful lithium-ion battery pack that is ready to go with a full charge within three hours when connected to a regular household outlet, or as little as 90 minutes when connected to a 220-volt dedicated socket, giving it the fastest recharging time of any plug-in vehicle on the market today. The PHV is capable of driving on electric power alone at speeds of up to 100 kilometres per hour, and drivers can take it up to 25 kilometres in the city using electric-only mode. Most importantly, it provides drivers with peace of mind because it automatically switches to its full hybrid gasoline-electric system once the electric power is exhausted. With free admission for all, the all-outdoors event is being held at Yonge-Dundas Square, running from 11 a.m. until 7 p.m. on Sunday, June 9. For more information, visit www.eco-wheelsshow.com.